Registrations received after June 5th are not guaranteed a T-shirt. Register online through 9:00pm on June 14th. Please bring the family and join us for a healthy morning of exercise and conversation. 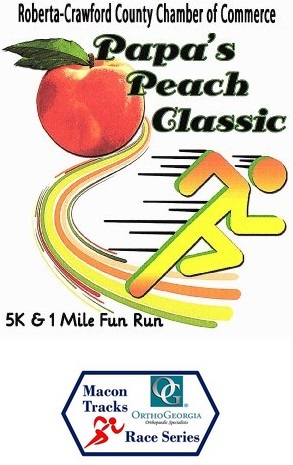 Enjoy the 5K or the 1 Mile Fun Run, then enjoy spending some time browsing around Dickey Farms Packing Shed and treat yourself to some Dickey Farms Peach Ice Cream! All proceeds support Roberta/Crawford County Chamber of Commerce. For more information, please contact Larry Carpenter at (309) 256-4332 or LaCarInco@gmail.com.